Please help support this site. Purchase hand-fired glass beads and jewelry at nitabeads1. Minimal Recommended Screening Tests Where SBS is Suspected. Dr. Charles Smith "The pathologist challenging shaken baby syndrome"
Shaken Baby Syndrome or Vaccine Induced Encephalitis-- Are Parents Being Falsely Accused? "New Definitions of Scurvy Affect Everyone"
Infantile Cortical Hyperostosis: Healing Scurvy? Shaken Baby Syndrome or Scurvy? Dr. C.A.B. Clemetson: SBS-Barlow's disease Shaken Baby or Barlow's? 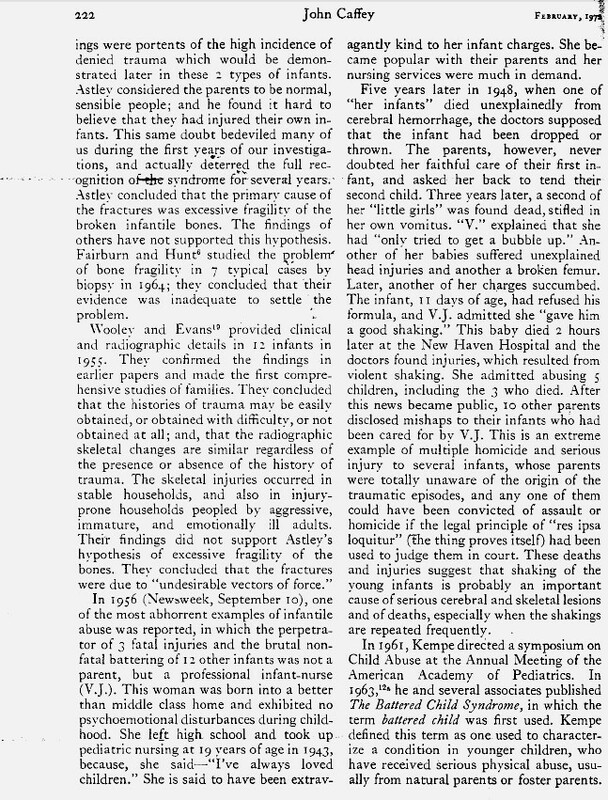 Inflicted Head Injuries in Infants Geddes JF, Whitwell HL. renamed "Abusive Head Trauma" or "Non-Accidental Injury"
* A fractured criminal justice system--a big piece for the rich, a small piece for the poor, and none for alleged SBS cases. C. Alan B. Clemetson, M.D. 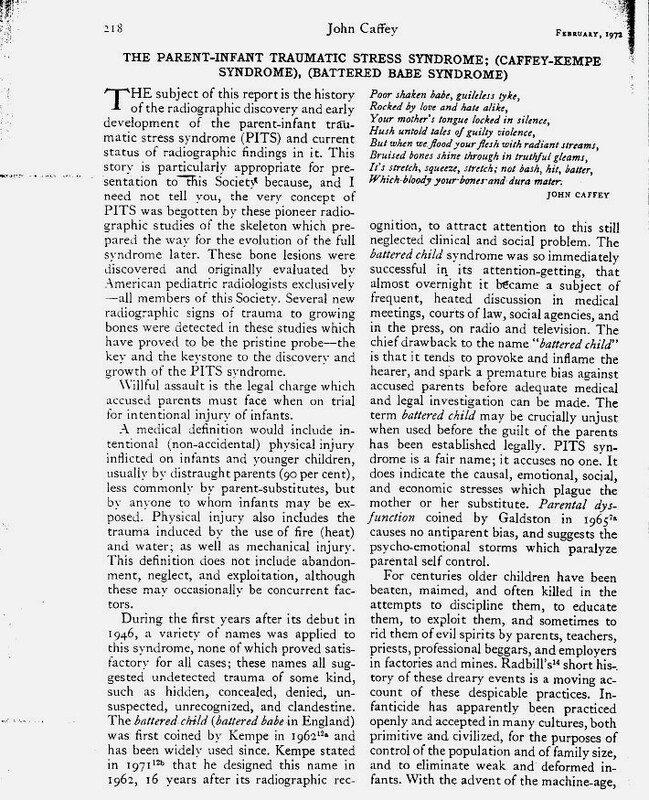 Caffey is often cited as the source of the diagnosis of “shaken baby syndrome” (SBS). Once the “classic” findings attributed to SBS are identified, it is rare for a differential diagnosis to be considered. Caffey focused on radiologic findings, but while he was aware of the possible diagnosis of scurvy, the radiologic signs of infantile scurvy may not have had sufficient time to develop. Other findings in his cases were compatible with scurvy due to toxic histaminemia, which can cause capillary fragility, retinal petechiae, and subdural hematoma. Although dietary vitamin C deficiency is very rare today in our country, both vitamin C deficiency and toxic histaminemia can accompany systemic infection. Toxic histaminemia may also occur following immunizations. 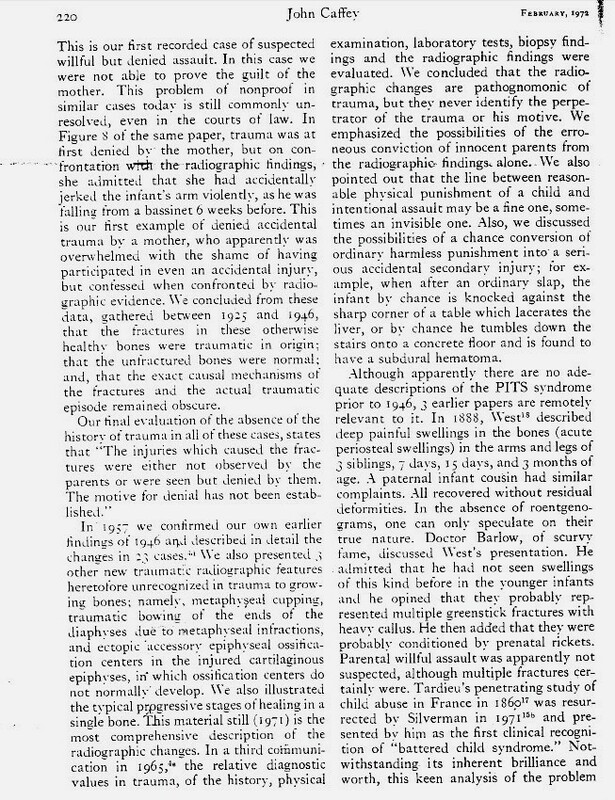 In 1946, John Caffey, a radiologist, described multiple fractures in the long bones of infants suffering from chronic subdural hematoma. None of the parents reported any knowledge of falls or physical injury, but Caffey suspected child abuse to explain the injuries. 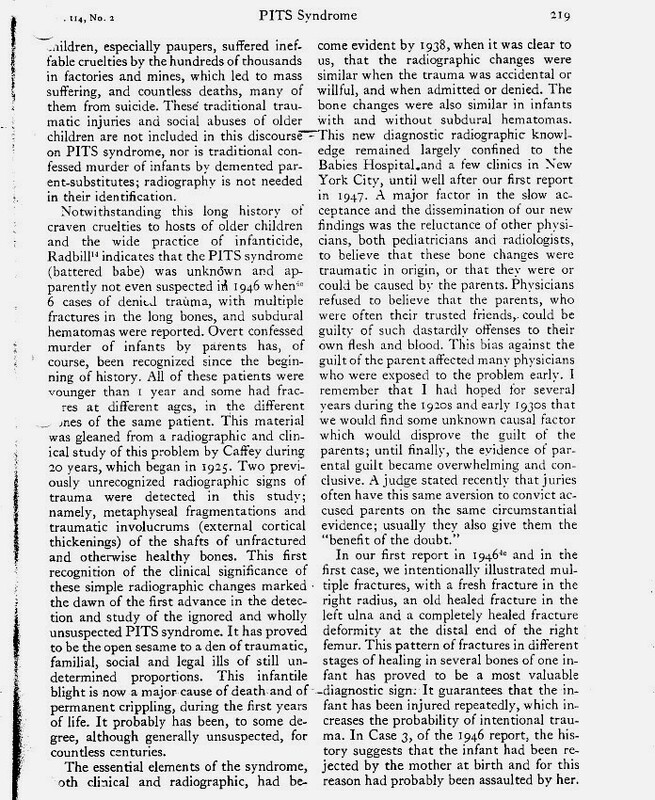 Following this retrospective, radiological study by Caffey, the diagnosis of “shaken baby syndrome” (SBS—including retinal petechiae, multiple fractures of the long bones, and subdural hematomas) evolved and has resulted in many men and women being convicted of child abuse, all without any meaningful consideration of a differential diagnosis. Although Caffey mentioned the word scurvy in the differential diagnosis of each of the six cases, he stated that none of the infants showed the typical radiological changes of scurvy: many of the fractures were in the shafts of the long bones, instead of at the junctions between the epiphyses and the diaphyses. The radiologic signs of scurvy, however, are variable. The most consistent finding used to be elevation and calcification of the periosteum of the long bones due to subperiosteal hemorrhage, above and below the fracture sites. In reviewing Caffey’s six original cases, this finding was present in most of the cases. And, although osteopenia and contrasting white lines of healing are said to be characteristic radiological features of classical scurvy, absence of these findings on radiographs does not rule out a scorbutic state.The precise time course of increased susceptibility to fractures and the development of osteopenia and white lines of healing seen on radiographs is not known. Bones may be vulnerable to fracture because of proline and lysine hydroxylase deficiencies affecting chondroblasts and osteoblasts before these classic radiological signs appear, especially if scurvy develops rapidly at an early age. Case 1. 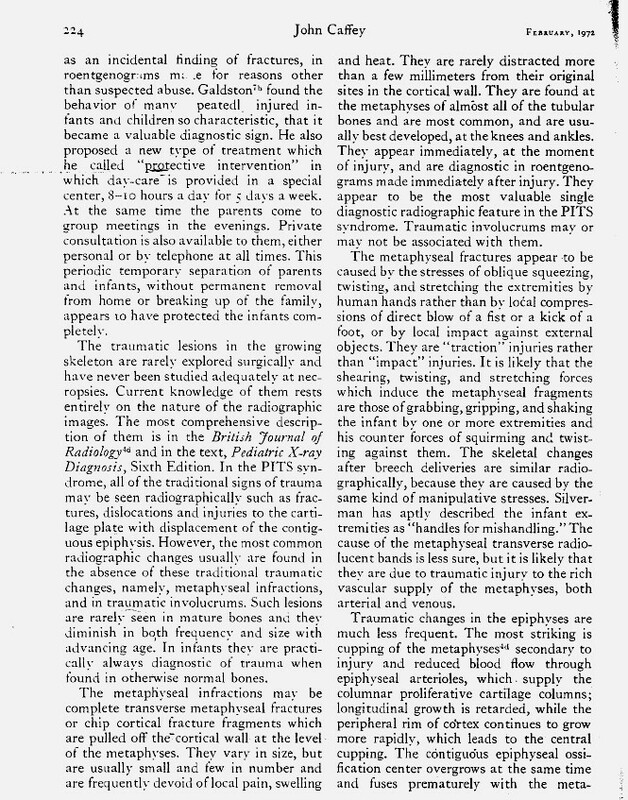 A purulent discharge from the right ear began at age 5 months and persisted for 2 months; a convulsion due to subdural hemorrhage occurred at 7months. Spontaneous fracture of the right radius occurred after nine days in the hospital. Case 2. Convulsions began at age 1 month. At 7 months, the infant developed soft, spongy, bleeding gums typical of scurvy, and retinal petechiae indicative of increased capillary fragility. 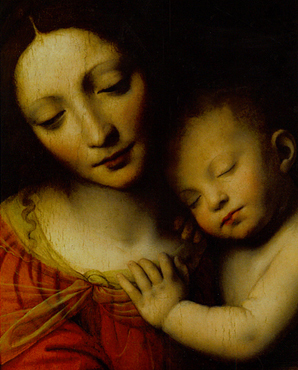 At age 8 months, he developed signs of subdural hematoma. Case 3. Multiple fresh hemorrhages were present in both ocular fundi. Petechiae were also scattered on the abdominal wall, and a large ecchymosis was seen on the left side of the face. Case 4. Radiographs showed evidence of epiphyseal separation at the proximal end of the right humerus, suggestive of scurvy. Case 5. Subdural hematoma and bone fractures associated with otitis media were present; black-and-blue spots on the fore head and face could be interpreted as either traumatic or scorbutic. Case 6. There was bilateral proptosis due to retrobulbar hemorrhages consistent with scurvy—akin to the unilateral proptosis seen in vitaminC-deficient18th century sailors. Even with adequate dietary vitamin C intake, infections can rapidly deplete ascorbic acid stores and increase the blood histamine level. In cases 1 and 5 above, it is noted that subdural hemorrhages occurred in the context of on-going otitis media infections. Many factors affect vitamin C metabolism, but the most important is systemic infection. 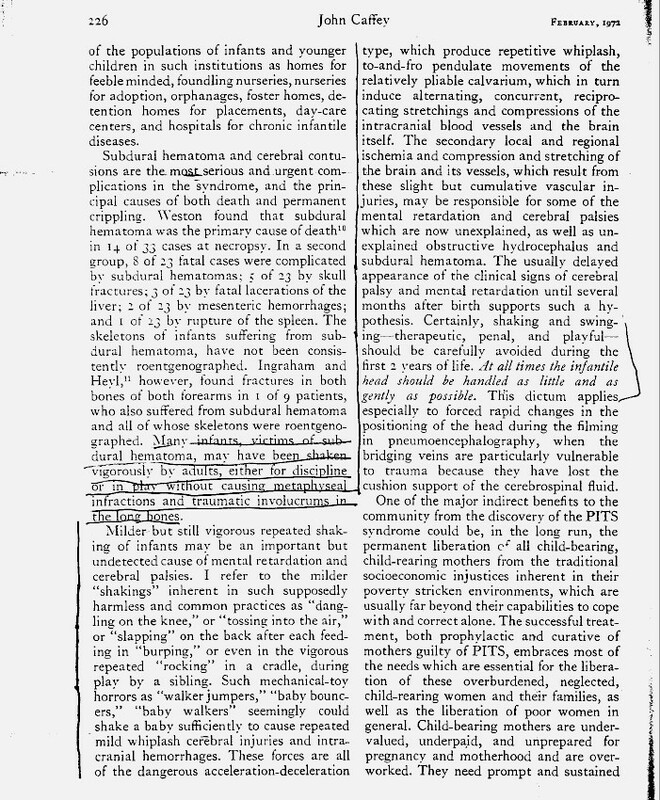 Hess, in his Cutter Lecture at Harvard Medical School, recognized that infection and vitamin C deficiency were both related to the development of infantile scurvy. 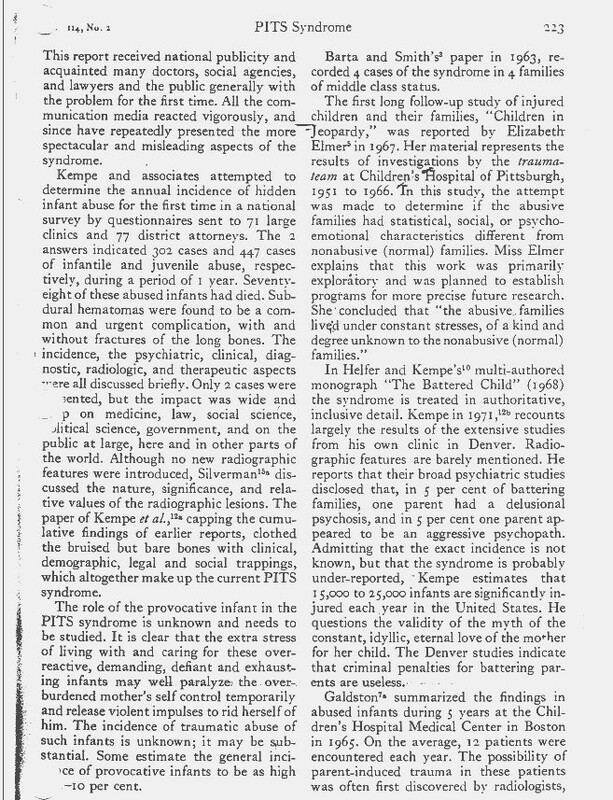 It was a number of years, however, before he realized that each affected the other—vitamin C deficiency predisposes to infection, and infection predisposes to vitamin C deficiency. Blood levels of vitamin C are also inversely related to blood histamine levels. Infantile scurvy used to occur most commonly after age 7 months, when swollen, bleeding gums were evident, as the lower incisor teeth had erupted and bacteria could enter the scorbutic gingival sulcus. In contrast, an earlier onset variant of infantile scurvy now occurs at 8 to12 weeks of age. Bleeding gums are rarely ever seen before the eruption of the lower incisor teeth at 7 months, so the diagnosis of scurvy may not be obvious. The hypothesis that subdural hemorrhages, retinal petechiae, and spontaneous fractures of the ribs and long bones can occur as an early variant of scurvy at about 8 to 10 weeks of age has not been adequately studied, and, therefore, has not been disproven. Unless and until vitamin C and histamine levels are actually measured in these infants, who are automatically classified as victims of SBS, we will not know the truth about causation. Unfortunately, even if the diagnosis of infantile scurvy is considered, most hospitals do not have the ability to measure either vitamin C or histamine levels. 4 months). Is this because Japanese infants are abused at a later age than American infants, or is there another explanation? 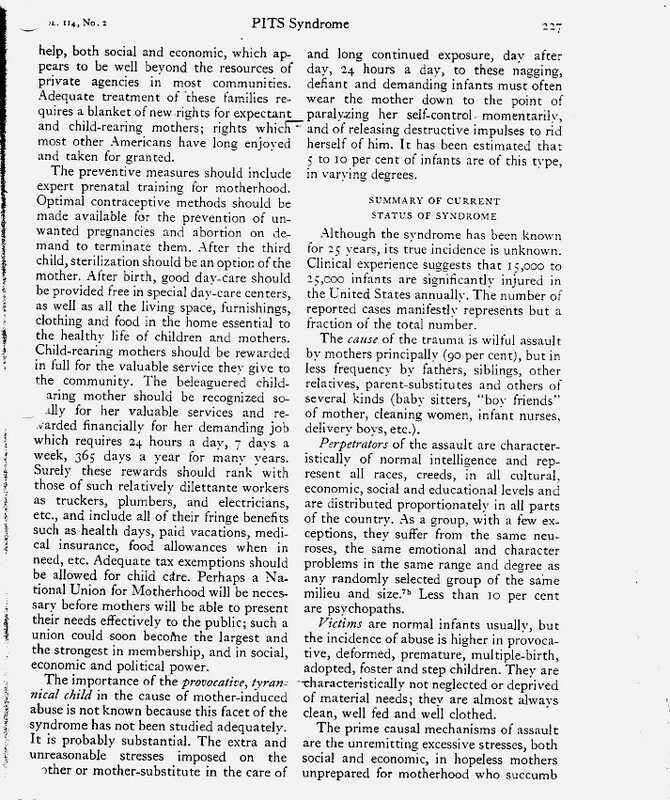 Gardner noted that these ages correspond to the standard ages when vaccinations have been given in the two countries, respectively. Infants with the findings attributed to SBS may be affected by a combination of factors causing generalized capillary fragility, which in turn affects the capillaries of the bridging veins between the brain and the dura mater—predisposing to subdural hematoma—due to inadequate ascorbic acid intake and/or depletion by infections or multiple immunizations. The defective formation of fibrous tissue, bone, and dentin that is known to occur in scurvy results from proline and lysine hydroxylase deficiencies that affect fibroblasts, chondroblasts, osteoblasts, and ameloblasts. However, the increased capillary and venular fragility causing the bleeding associated with scurvy is due to a many-fold increase in the blood histamine level, as shown by Clemetson. The total blood histamine increases exponentially as the plasma ascorbic acid falls. Majno and Palade have shown that toxic levels of histamine in the blood cause openings in the tight junctions between the vascular endothelial cells, leading to extravasation of blood. Leakage of blood into the tissue slowly leads to local hemolysis, as evidenced by the yellow color characteristic of the fluid of old subdural hematomas. Hemolysis also leads to local ascorbate depletion. Chatterjee et al. reported increased blood histamine levels following vaccinations in guinea pigs. This effect would likely be heightened when six vaccinations are given at the same time at 8 weeks of age, such as is now the custom in most English-speaking countries. If vitamin C levels are low at the time of vaccination, a resulting toxic histaminemia may cause further clinical problems. 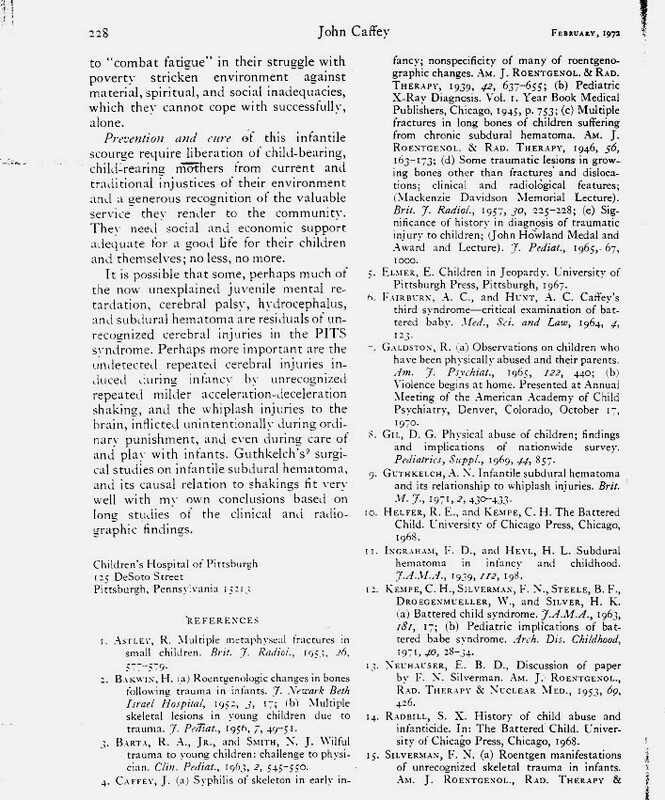 A relevant finding by Archie Kalokerinos is that the increased death rate following vaccination of Aboriginal infants in Australia was arrested by administering vitamin C at the time of vaccination—because ascorbic acid “detoxifies” histamine. Indeed, Chatterjee et al. demonstrated that ascorbic acid is essential for the detoxification of histamine (in guinea pigs), by converting it to hydantoin-5-acetic acid, and on to aspartic acid in vivo. Illustrations of the physiology and pathology of ascorbic acid and blood histamine have been presented previously. Other factors that are not given sufficient weight in evaluations for SBS are the presence of chronic subdural hematomas, often occurring during or shortly after birth, and the fact that chronic subdurals are susceptible to rebleeding. 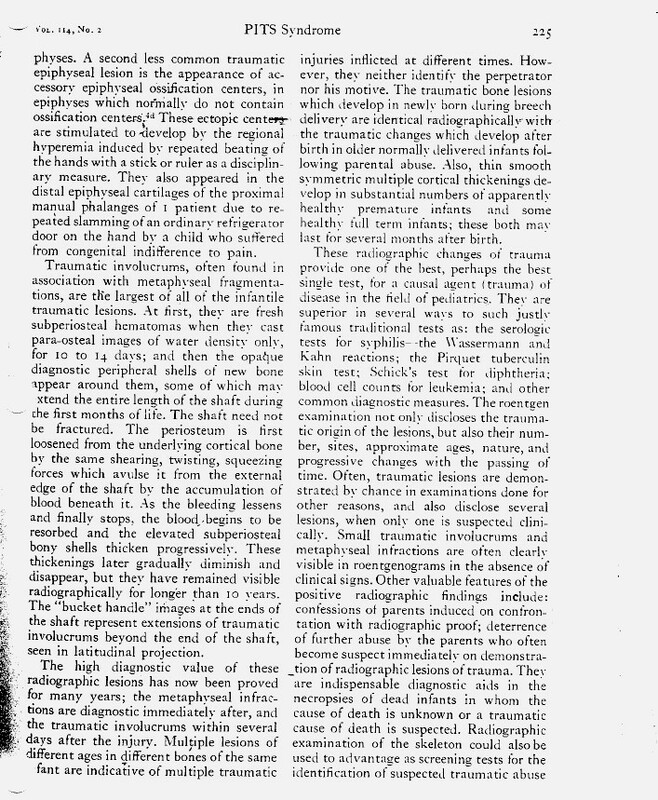 Subdural hematomas have been found using fetal ultrasound in utero, before labor, as reported by Gunn, and also following normal, spontaneous delivery, as reported by Chamnavanakietal. The tendency to rebleed could be exacerbated by toxic histaminemia through the mechanisms explained above. manifestations of deficiency/toxemia must be assessed. It should be helpful to reduce the number of vaccines given simultaneously or in rapid succession. A better understanding of these factors may help prevent adverse reactions following vaccinations. Dr. Kalokerinos has shown a clear benefit by providing supplemental vitamin C at the time of vaccination in some children. Vitamin C is an extremely safe substance—the only ill effects tend to occur in older children and adults who suffer from hemosiderosis due to sickle cell disease or Mediterranean anemia. Iron storage depletes ascorbic acid stores via oxidation and hydrolysis, and the dehydroascorbic acid so formed can be harmful. Even then, the toxic effect of vitamin C may only be mild and temporary in young infants. The so-called “classic” findings of subdural hematoma and retinal hemorrhages in infants, without any evidence of major trauma, do not always automatically equate to a diagnosis of SBS. As in all other areas of medicine, it is prudent to do a differential diagnosis. 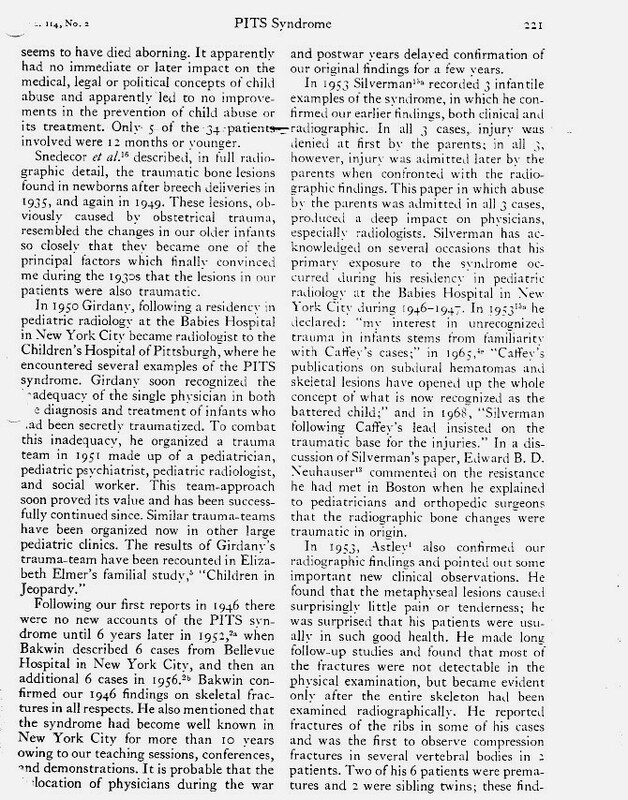 The findings in the cases that initially established SBS as a diagnosis were compatible with and even suggestive of infantile scurvy or toxic histaminemia. Gardner HB. Immunizations, retinal and subdural hemorrhages: are they related? Author publication: NEXUS MAGAZINE "Seawater--A Safe Blood Plasma Substitute?"